Digestion is key to health. If you have been practicing natural therapy for a long time now, it wouldn’t be something new to you, but for those who are new to natural therapy, here is the first rule. Most diseases are caused due to food. This could be excessive food or lack of certain nutritional values. Yet others may be caused doe to contaminated food , usually chemicals or germs. In natural therapy most of these diseases are cured with diet, Sometimes fasting and with a strict constrained proper diet watching nutritional values at all times. With that said, Flora Multi Probiotic capsules are packed with the key ingredients which helps eliminate a range of symptoms which are related to digestive health. For those who are not aware, a simple gastric problem could lead you to symptoms up to chest pain and other body aches. Often something to worry about, chest pain could be usually linked to heart attacks and severe fatal diseases. With lack of attention, Such small problems could lead to complications and worries. Digestive problems such as constipation, gas, bloating, flatulence, abdominal pain, irregular bowel movements, gurgling, regurgitation, nausea, etc. are daily complaints of every individual these days. Diet is off course one solution to these problems but not all can follow the diet constrains and especially not always in today’s hectic and busy schedule. In this situation Probiotics comes into picture. Probiotics refer to live micro-organisms that are known to offer health benefits to their host. Clinical research and studies have proved that multi-strain probiotic cultures significantly impoves the irritating causes of digestive distress and uneasiness. Flora Multi Probiotic capsules are packed with the key ingredients which helps eliminate a range of symptoms which are related to digestive health. Clinical research and studies have proved that multi-strain probiotic cultures significantly impoves the irritating causes of digestive distress and uneasiness. The two most essential probiotic strains – ‘Lactobacilli’ and ‘Bifidobacterium lactis’ (Bif) have proved to be the two most advantageous and most favorable strains to help digestion problems. Clinical research also proves that Bif helps in regular and healthy bowel movements and also relieves from several upper and lower gastrointestinal symptoms. As you take muti-vitamin supplements daily considering its need in the body, similarly to stay healthy your body needs more than just a few cultures, which means that daily intake of a multi-strain probiotic supplement is also equally important to stay healthy. And here we have a multi-strain probiotic supplement, each capsule of which contains not just few but 16 probiotics working together and up to 16 billion active cultures (also referred to as CFU – colony forming units). 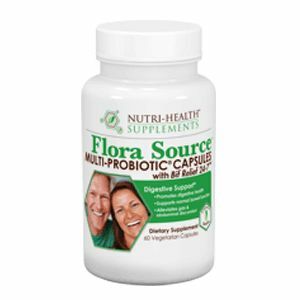 Yes this is none other that “Flora Source Multi-Probiotic” supplements by Nutri-Health. This supplement is available in both capsule as well as power form.